Reason Why AEC 127 Notification was Cancelled ? 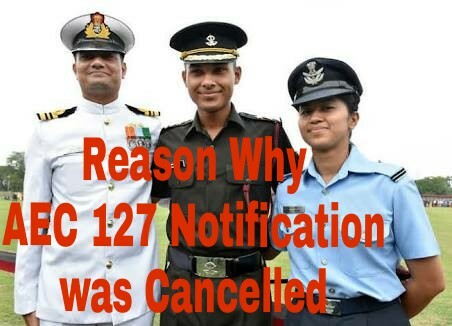 Hello Candidates, Many of you would have this question why did AEC 127 notification was cancelled this time so we thought of clearing your doubts by writing this article. Checkout the complete article and do share with your friends so that they would also know about this. Feel free to ask your queries in the below comments. AEC (Army Education Corps) which is the notification to Join Indian army officers for education core is the entries for the candidates who are post graduates and are interested to join army as an officer's. This entry is generally notified 2 times a year. Many candidates apply for this post who have completed post graduation and the profile of this entry is to educate the candidates at the training centers once you complete your training and after 2-3 years of your commission you will be joined as a instructors at any of the training centers IMA, OTA or NDA. As Indian army is already having shortage of Officers and many of the officers are engaged in AEC so their was a discussion about closing this education core as the officers would be shifted to infantry and education Havildars will take the place of officers so that we don't have shortage. So because of this discussion they this time cancelled the AEC 127 notification so that their is no wastage of officers for education purpose. It's being said soon their will be different notification for post graduates candidates as this was only the entries for the candidates from where we could apply for the post till the age of 27. Whereas The entries have arrived and the notification is up all the engineers can apply for the post. So this was all about reason why AEC 127 notification was cancelled hope now you would be aware about the reason why did the notification was cancelled. We still don't know will the notification come in the future or not. Feel free to ask questions regarding Reason Why AEC 127 Notification was Cancelled in below comments.